Risedon™ Plus is indicated for the treatment and prevention of osteoporosis in postmenopausal women. It can be also used to increase bone mass in men with osteoporosis. 01 Risedon tablet should be taken orally once a week (Day 1 of the 7-day treatment cycle) then 01 Calcium 500 mg tablet should be taken orally with food daily on each of the remaining 6 days (Days 2 through 7 of the 7-day treatment cycle). 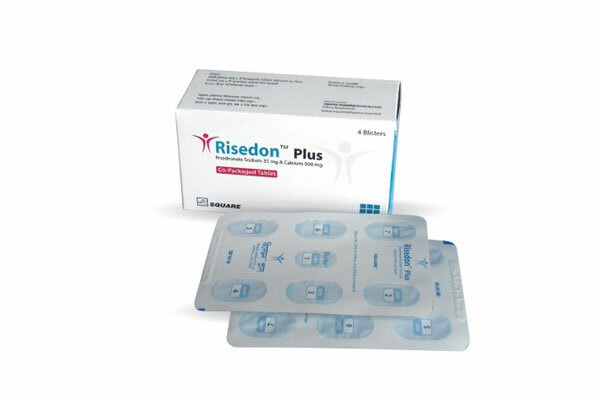 Risedon™ Plus: Each box contains 4 blisters of RisedonTM Plus having 1 tablet of Risedronate Sodium with 6 tablets of Calcium Carbonate in each blister.